I thought I'd do a quick post about what my eats have been looking like lately! This week has been a lot of me getting back on track with my nutrition after a month of overindulgence, stress, and lotssss of sugar. Anyone else know that feeling? I'm happy to report that I am feeling AMAZING after a solid week of good eats, even though I had treats and sugar here and there. The majority of my food was wholesome and healthy, and when 80-90% of our diet are made up of whole foods, there is definitely room for treats! Since last week, I already feel the bloat fading, have more energy, and am even less anxious then I was a few weeks back. A healthy lifestyle can effect so many areas of your life, not just your weight! I'm hoping to remember that the next time I let stress take over...I hope you can too! And now, onto the eats! This granola/cereal is our FAVORITE. I have been buying it for my husband but I stole some this week as an afternoon snack and oh my...so good! Hits the spot when kept in the correct portions of course! It is the vanilla almond cereal from Trader Joe's! My husband and I also went out for "breakfast" for lunch. We tried this buttermilk spice muffin from Mimi's, and after a few bites I was done with it...so sweet! I also got a 2 egg breakfast with some taters!! A Togo's farmers market wrap was also eaten...so many veggies in this wrap and it filled me up without weighing me down. It's all about the veggies, folks! And of course, some summertime fruit. Fruit is just so refreshing and chock-full of vitamin C, antioxidants, and anti-cancer properties! Make sure to take advantage of all the seasonal fruit this summer! And of course, my Shakeology. I never miss a day of this superfood shake. I absolutely love the benefits I've been experiencing, from the regular "movements," to clearer skin, to a better immune system, and beyond! Plus, it tastes delicious and is so easy in the busy mornings...so it's really a win-win! I also made a big pot of beans and rice this week by combining a can of cuban black beans, a packet of frozen brown rice, salsa, and frozen bell peppers (all about convenience lately)! Paired with a salad and or cooked veggies and it was a great and easy meal! And yes, there were treats involved too. I DID indulge in a Wetzel's Pretzels this week, the cinnamon sugar bites. They are my all time FAVORITE indulgence. These used to be a trigger food for me. I'd have 2-3 bags and AFTER that, they'd send me into a massive binge. But lately, I've been able to enjoy ONE from time to time as my ONLY treat, and then go on with my regular day. It doesn't cause me to go haywire anymore, and I'm so thankful for that! Freedom with food is delicious, folks :) and so so....FREEING! And lastly, I went to Trader Joe's for our weekly shopping and tried this new salsa....so spicy but pretty yummy! I bought some for us to enjoy during the NBA finals tonight! SO that's it! It was a pretty good week of eats! 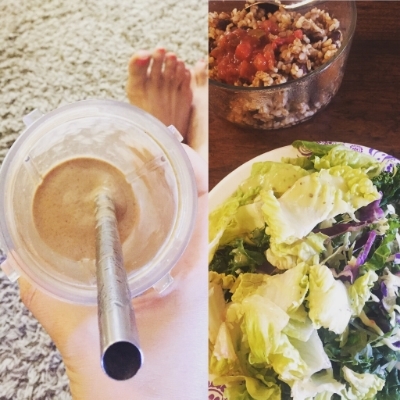 I'm planning on doing more of these posts as a way to keep myself accountable, but also because I love food and I love sharing it! Now it's time to snuggle with the hubby, have some dinner, watch the finals, and sleep early because tomorrow is day 1 of Insanity max 30! I'm excited but nervous at the same time!! Wish me luck! As always, if you have any questions, want to join one of my accountability groups, or want any additional support in your life, be sure to email me at tveen.verano@gmail.com or click on the "work with me" page above for more info! I love getting to know my readers and I'd love to start chatting!